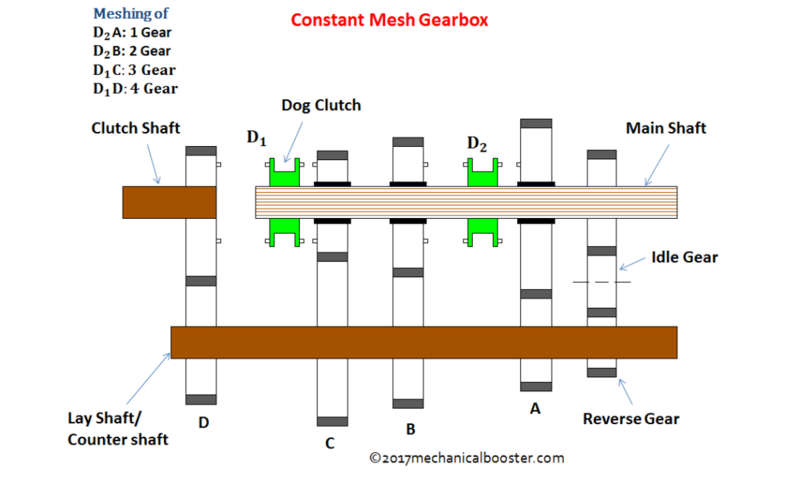 How Constant Mesh Gearbox Works? The introduction of transmission in 1894 gave the new platform to the research minds of the century and forces them to focused their research on the transmission system as it was the new boom in the automobile industry so the detailed study of the sliding mesh gearbox had started and raised many questions, Why the shifting of the gears required special technique (double-de-clutching)? Why there was lots of sound while shifting the gear?, Which gave rise to the development of new transmission system i.e. 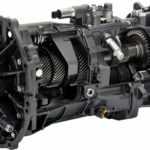 Constant mesh gearbox or transmission, let’s just find more about it. 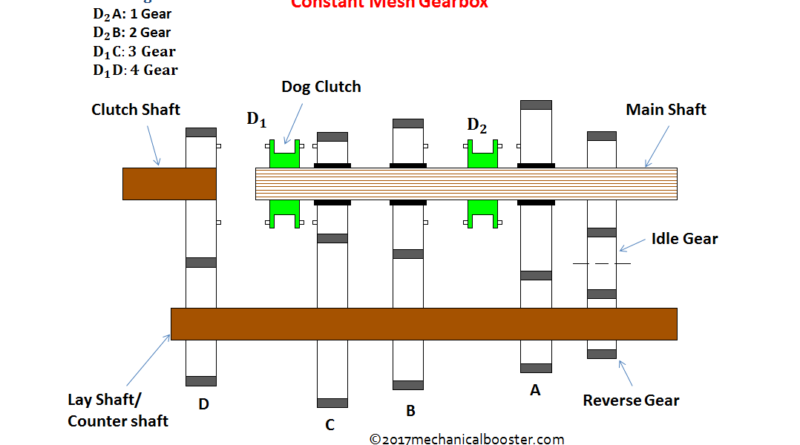 A constant mesh transmission is the type of manual transmission in which sliding gears from the sliding mesh transmission is replaced with the constantly meshed pairs of gears and the new shifting devices named dog clutches are introduced which helps in transmitting the required output to the main shaft by making contact with the appropriate pair of the meshed gears. A constant mesh gearbox usually comes with 4-speed 1-reverse manual transmission configuration. Why do We Need Constant Mesh Transmission? The shifting of gears was not an easy task as the shifting required special technique which were not at all everybody’s cup of tea, a skilled driver was required for driving such vehicle, the special technique required was Double-de-clutching. 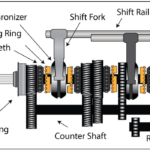 Note – Double-de-clutching- it is the technique as the name indicates that required double engagement and disengagement of clutch for shifting a single gear. i.e. When driver wants to shift the gear he first presses the clutch pedal and bring the gear to the neutral, than again he releases the clutch pedal and accelerate in order to increase the speed of the lay-shaft so that the meshing of appropriate gear can occur, then again he presses the clutch pedal and bring the gear liver to the required gear and release the clutch pedal and finally the required gear is obtained. Since, the gears is to be meshed are in continuous rotation with different speed so the meshing of these gears can cause breakage to the gear teethes or continuous wear and tear is there. The shifting of gears is a very noisy process. High maintenance is required as sliding and meshing of gears causes frictional wear of shafts and gears. (i) Main shaft- Also known as the output shaft, the splined shaft over which the dog clutches along with gears are mounted. (ii) Lay shaft- An intermediate shaft over which the gears which are in constant mesh with main shaft gears are mounted. 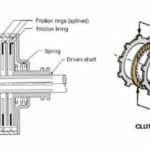 (iii) Clutch shaft- Same as sliding mesh clutch shaft carries engine output to the gearbox and transmits it through the constantly meshed lay shaft gear. (i) Helical gears- having angular cut teethes over cylindrical cross-section metal body. (ii) Bevel gears- having angular cut gear teethes same as helical gears but with conical cross-section. 3. Dog clutches- These are the special shifting devices responsible for transmitting appropriate gear ratio to the final output, the pair of gears with suitable gear ratio comes in contact with the sliding dog clutches which in turn transmit the gear ratio of the pair of meshed gears to the final output shaft. 4. Gear lever- It is the lever used for shifting or sliding the dog clutches over main shaft and is operated by the driver. 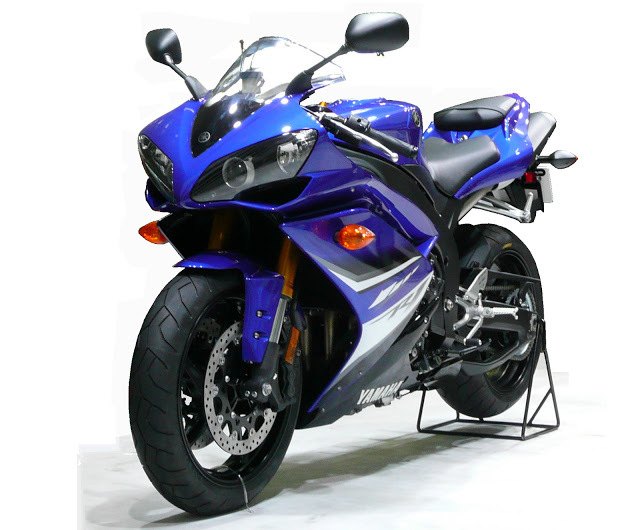 It is the gear which provides maximum torque and minimum speed to the final output shaft which helps the vehicle to start moving from its initial state, when the driver select the 1 gear by pushing or pulling the gear lever the dog clutch with corresponding pair of meshed gear i.e. smallest gear of lay shaft and largest gear of main shaft, slides right or left over the splined main shaft and make contact with the meshed pair and finally the 1 gear is obtained. It is the gear provides higher speed and lower torque than the first gear and is obtained by right or left sliding of the corresponding dog clutch towards the appropriate pair of meshed gears i.e. second smallest lay shaft gear and second largest main shaft gear, in order to make contact with the pair. It is the second highest speed gear having very low torque and is obtained by the right or left sliding of the corresponding dog clutch towards the appropriate pair of meshed gear i.e. second biggest lay shaft gear and second smallest main shaft gear. It is the highest speed gear of 4-speed manual transmission in which maximum speed of the clutch shaft is transmitted to the final output by right or left sliding of the dog clutch to make contact with the pair having largest gear of the lay shaft and smallest gear of the main shaft and very low torque and highest speed is obtained. It is the gear which reverses the direction of rotation of the output shaft in order to move vehicle in reverse direction, it is obtained with the special gear known as idler gear which mounted between the lay shaft and the main shaft when the reverse gear is selected the dog clutch makes contact with the idler gear and reverse gear is obtained. Various farm trucks, cars like ford model T and motor bikes used this type of gear box before the invention of the latest of all manual transmission i.e. synchromesh transmission introduced by general motors in 1928. 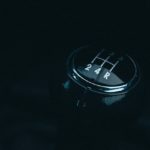 What is Manual Transmission and How it Works? 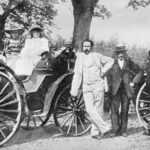 History of Automobile – How Modern Automobile Evolved? 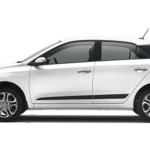 What is Firing Order of 4 and 6 Cylinder Engine?